Reception: Wednesday, Sept. 13, 4-6 p.m.
Gelatin Silver Print: U.S. Army Signal Corps, May 9, 1945. 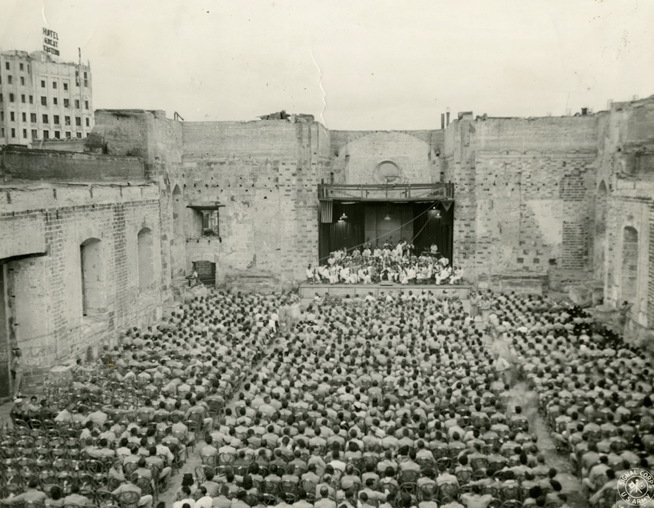 “Liberation Concert” with Herbert Zipper conducting the Manila Symphony Orchestra in the ruins of Santa Cruz Church, Manila, The Philippines. From the collection of The Herbert Zipper Archives, Crossroads School for Arts & Sciences. The photographs, letters, sheet music, artwork and artifacts exhibited will tell the (mostly) untold stories of the family, friends, colleagues, places and events in the lives of Herbert Zipper (1904-1997) and his wife, Trudl Dubsky Zipper (1910-1976). The exhibit will showcase the diverse archival materials, arranged alphabetically by subject, dating from early 20th-century Vienna; 1930s and 1940s England; pre-World War II and Japanese-occupied Manila; the United States from 1946 on; and 1980s Asia. This year marks the 20th anniversary of the passing of Herbert Zipper, a conductor, Holocaust survivor and educator who bequeathed to Crossroads School the historical materials that now comprise the Herbert Zipper Archives. Brought to the School by Crossroads co-founder Paul F. Cummins after Zipper’s death on April 21, 1997, the archive provides a unique opportunity for students to engage in primary-source learning. The archive is open by appointment to researchers and scholars.